Maybe you feel this sometimes, that the internet is real and yet not totally real? The people are real, our issues and experiences are real . . . but we set up hashtag tribes, have our circle of friends, build our website homes and play in environments like Facebook, Instagram, the news pages, twitter, and it all kinda reminds me of a RPG game. There is a sense of constructed control here online, even when life keeps throwing curve balls, and yet, there is a sense of helplessness as I read the highs and lows of others sharing on the internet. Like the real world, life changes here too. All of this to say, it’s time for another redesign on the blog, as you might have noticed. For one thing, most of the links are related to my writing rather than cancer. That doesn’t mean Bumpyboobs is all about the business. If it was, it sure wouldn’t feel real, and wouldn’t still be called Bumpyboobs. This blog has been a dear friend of mine during rather hard times, and those of you who read the posts have become part of that friendship. The truth is, I still need Bumpyboobs. She is there for me to talk about the highs and lows, and all the bizarre in-betweens. I prayed never to be a blogger who writes about stage four cancer from experience, but here I am. Here I am – and yet, Bumpyboobs is so much more than that. This blog has chronicled my longing for that allusive sense of home. It’s traveled with Zsolt and I country to country. It was there for my wedding anniversaries. Together this blog and I have grown to reflect all the changes – good, bad, hard, fun . . . It was here for Zsolt’s PhD, the arrival of his residence visa, for my random story writing, the loss of my grandmother, the moving into our own place, and for the launch of my novel along with the Kickstarter campaign. This blog is an ever-changing reflection of life, and I can dress it up however I please, which feels really good when life is a constant limbo game. If you read this blog, than you know I love to write. The truth is, writing saved me when I was diagnosed, and taking that writing even further has saved me again when I learned about stage four. Instead of retracting away from obligations – I was compelled to run head first into them. It is totally exhausting, sometimes overwhelming, highly emotional, and occasionally plain stupid. However, ,there is a strong part of me that wants to live hard by writing more stories, raising funds, publishing books, loving design, getting creative, thinking of promotion, cheering on others, honouring amazing women, meeting more people, and continually reaching for the golden ring on the never-ending merry-go-round of life. I’ve grabbed it before; I want to grab it again, and again, and again. Cancer is on my mind every day. But it doesn’t own my passions or ambitions. It throws me toward the edge of depression. And in response I retreat into this creative space – telling more stories, writing silly nothings, thinking up plans that are bigger than I can tackle all at once. Sometimes I panic that I’ve done nothing with my life. Other times I remember that the ability to create and to care are valuable things. I want Bumpyboobs to be part of “Catherine the Writer/Novelist” because these are real and present identities. It has been healing for me to be ambitious, even if it’s also terrifying along with exhausting. But this is a magical place (as I’m sure you know if you have your own blog, diary, journal, etc.) When I want something, I bring it to the blog (like The Adventures of Claire Never-Ending) to help it become real. So what if this space is virtual – a home I’ve programmed that cannot be shown-off in the real world? So what? (I ask to myself, challenging my own insecurities). This is a fertile ground for ideas to grow. It’s a special thing, at least to me. 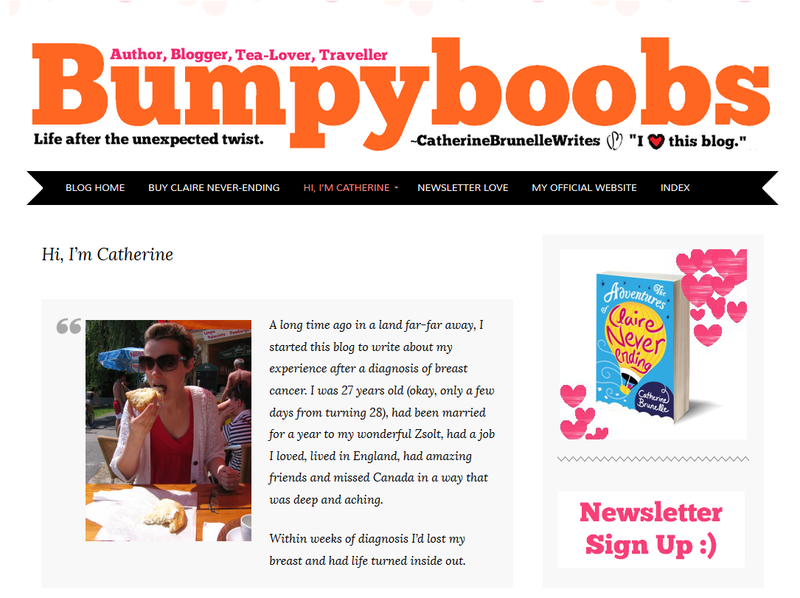 Therefore, all that emotional preamble to say this: Welcome to the redesign of Bumpyboobs! It’s an accompaniment page to my website www.CatherineBrunelle.com, which is currently in redevelopment as well, to pull together the different hats I wear in my work and online. I’ll let you know when that is done. Also to come, a change in my twitter name. Eep!! That’s a really hard one, but it needs to be done. I love Bumpyboobs, but this lady is much more than Bumpyboobs. Mind you, it’s damn hard to find a handle involving @Catherine___ that hasn’t already been taken! I love your “Bumpyboobs” blog. It is more than a blog about cancer. It is about a wonderful person I know named Catherine who demonstrates wisdom beyond her years, who shares her fears and joys in a way that is inspiring to us, who demonstrates written and artistic creativity that is uniquely her own, and who is deeply passionate about love and life. Your words are your voice which resonnate with many of your readers. Bumbyboobs has been your artistic pallette which I have followed since day one. It has shown me your writing talent long before your first novel was published. Your Zsolti stories and other whimsical stories have kept me smiling for days. As for a hashtag, I have one in mind which would be a play on the title of your first novel … but you probably aleady thought about that one. I love the re-design of your blog page! and I am so inspired and delighted with how you continue to think outside the box about what helps defines you – about life, about travels, about love, joy, creativity, your zsolt, the virtual community, and your writing. sometimes, it’s frustrating just trying to convey how “real” my bloggy friends are – how much they show caring, understanding, kindness, and love that is so near and dear to my heart. but guess what?! those same people, the ones I adore, don’t realize that sharing our stories with such candor and then lending support and letting each other know we “get it” has made me a better friend and loved one in real life. so I say, along with you, “so what if this space is virtual…”?! it is powerful, it is eye-opening, it is truth, and it is as real a slice of life as “real” can be. It’s the approach of spring, I reckon! You are such an inspiration, in “real” life and this online space. Writing is such a savior, isn’t it? I look forward to seeing what you create next. I love your blog … I love your writing … I love your spirit … and quite frankly: I LOVE YOU! I’m so happy for the success of Claire Never-Ending and the amazing inspiration you bring to everyone around you. You, my friend … are a gift! I have found this world of blogging, writing, learning and friendships over the last 4 years while fighting my stage IV diagnosis. It has taught me things I need to know to help me fight this battle, but in saying that always reading about cancer has in some cases taken me to a depression point. Catherine you are a breathe of fresh air because you are living, loving and learning but mostly you are living each day to the fullest and that is what this thing we call life is all about. You make me smile, your book made me happy and your writing about all of it is inspiring. I look so forward to spring, summer and fall, and I look forward to following you in all formats.